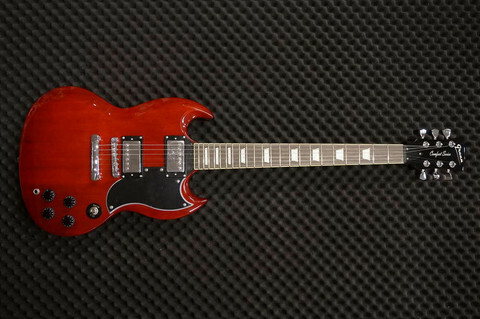 Here we have a really cool guitar that delivers the classic SG raw sound that is so typical of bands like AC / DC. The SG was developed as a lighter alternative for the Les Paul heavy body. Green SG has a thin mahogany body, but still thicker than the originals. About the same thickness as a traditional Strat. This makes the Green SG balance somewhat better than the originals, where the body's weight in relation to the neck makes it drop forward in the shoulder strap if you release the grip on its neck. We do not like the feeling of the front heavy guitars.... Thanks to good quality wood materials we have got this guitar offers a raw and heavy sound. This is a guitar that really impresses! For those not yet played an SG You will be surprised of the playing comfort specially in the upper part of the neck. Here you get access to the notes with complete ease, in a very different way than other SG guitars. The neck is thinner than the normal SG. Very easy to play and beautiful! We also have options with a little fatter neck for those who prefer it. It affects the tone and sustain for the better. It is not superfat, more like a 60-s neck. Green SG is nicely painted in a transparent red color. Mahogany is a neat wood so it is visually very delicious. Our SG models are renowned for their high playing comfort. String action is really low. Really comfortable to play on!